Delphi 2007 for Win32 Update1 is now available. This document describes the steps to apply Update 1 to your Delphi 2007 for Win32 by using the auto update mechanism over the Internet. 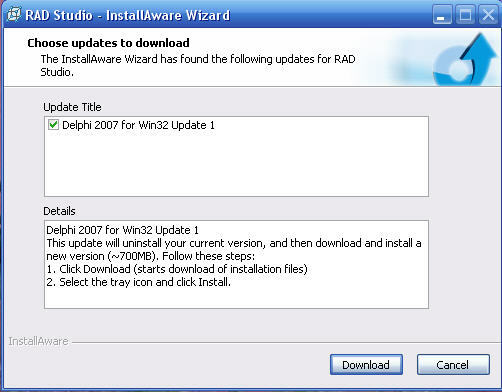 Automatic updates: When you installed Delphi 2007 for Win32, if you checked the “Automatically check for updates when RAD Studio is run,” you will be prompted when Update 1 is available (typically, you would start the following procedure at Step 4). 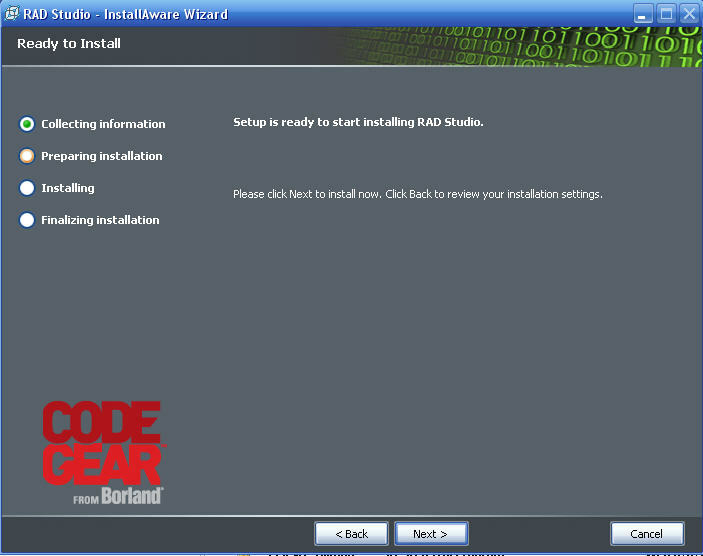 Update using the installation DVD: To apply Update 1 using your original installation DVD method, see the Installation notes for Delphi 2007 for Win32（Update 1）& C++Builder 2007 at http://dn.codegear.com/article/36574. 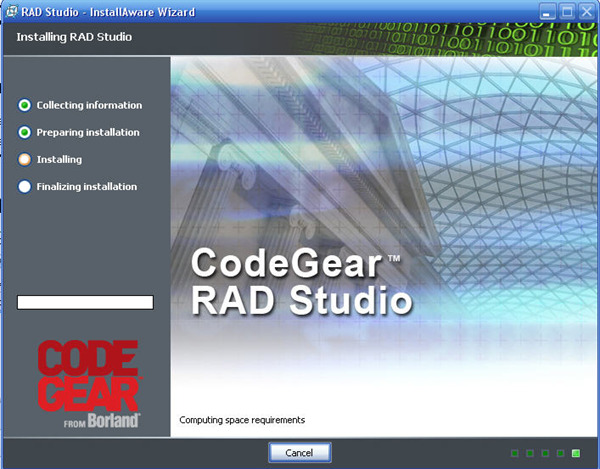 Select [Start | RAD Studio | CodeGear RAD Studio | Check for updates]. On the language selection dialog, select the language you want to use and follow the steps of the wizard. Note: if you don’t see this dialog, close other windows. The Install wizard prompts you for the location of some files required for the update. If you have write permission for that folder, you can just click [Next] and move on to the next steps. 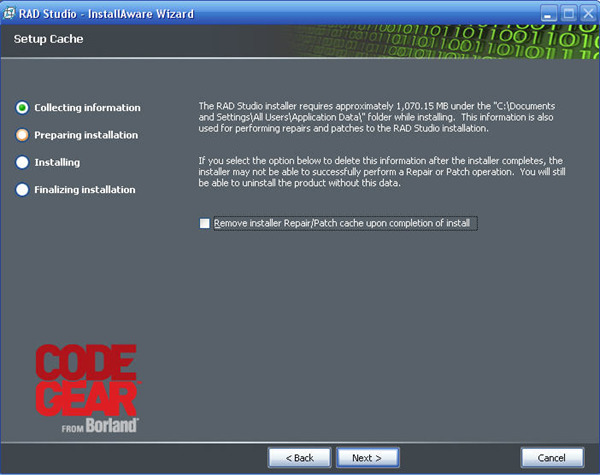 On the Setup Cache dialog, verify that you have enough disk space to complete the update. If you do not want to keep the Installer Repair/Patch cache files, check the box to remove the cache. Click [Next]. On the “Ready to install” dialog, click [Next]. In the IDE, select Help>About. The version number should be 11.0.2709.7128 (changed from 11.0.2627.5503). The auto update mechanism cannot detect the need for updates if you cancel the update process or otherwise exit without success. In this case, you can download setup.exe from the registered user’s web site and execute the setup program with the /upgrade option. Click [Delphi 2007 for Win 32 Update 1]. Click the FTP button for the setup.exe file. If you use IME (input method editor), the installer might hang. In this case, kill the installer, open a command prompt, and re-try the process. In order to avoid this issue, you can add following registry entry. The type of this entry is REG_DWORD and the value is 0.